In the morning, the rain collected smoke and ashes into puddles. Two neighbors who had never spoken before talked about the fire. I hope nobody was hurt, one said. I hope nobody started it, one said. These old buildings. The other one said, there were no fire walls. Neighbors gathered on the edge of the parking lot to talk to each other about the fire and speed-dialed cell phones to talk about the fire. The fire came out on the porch, appearing on the balcony like a celebrity stepping forth for the crowd, and the fire ate up the roof in one orange swallow. The fire fighters turned their hoses to the balcony. They arched their water into the holes in the roof. They pressed their backs against the conifer trees and ran their streams at the old building. The smoke blacked the planes out of the sky. The smoke seeped to the ends of the building, curling calmly out of the edges under the eaves. Through the fire: the sound of 100 fire alarms screaming like a flock of birds. Crime reporter, an in-depth introducton to a job. Dreams of the alien abducted. Parts of the body of a lynched, burned man. Forsaking the book review section. Journalist, Pulitzer-winning report dies in firey car wreck. Nashville newspaper was Halberstam's grad school. Flexability, trickery, and the work of ravenologists. Call it the Pulitzer Pause. Where we look when we see. Between the West and Communism, a short history of Yeltsin. Where has Harlan County gone, and will it rise again? Racist spokes-fictions, then and now. Expelled "a wasteland in which Christian bureaucrats and stoner teens are indistinguishable." Specialization , education and fragmentation. Archives of secondary material on PKD. Weapons of the war in Iraq. It was a threadbare little, foul little piece of land up on the top of the bluff. It was red soil sprinkled over chalk rock. The water was murky milky colored coming up foul from the ground and the river was an ugly stream of muddy red and weedy green. The field was flat, moving blankly away from the river. The river stretched out, so-called in Spanish, The Arms of God. The weeds grew in splotchy patterns of Johnson grass and Crab grass and that's where it was. The Blue Bonnets bloomed blue in the clearings in the woods. But not here. Not in the open in the sun where the rain beat too hard and the sun shone too hard and copper heads lay out in the afternoon. When the foxes passed they kept to the edges, following the lines of shade and the string of fence posts on their paths between rabbit holes, watering holes, garbage cans. The snakes came through the grass, moving fast across the pavement and back into the grass again. The dogs kept to the roads, kept walking along the side of the cars. In those days, from far away, you could hear automatic gun fire. You could hear Nancy Sinatra sing about walking boots made for walking. You could hear the waiting of two sides, the scratchy voices of wire taps and negotiations and the rumble of generators and the click of shuttering cameras. In those days, from far away, we saw the smoke go up over the plain piece of land. The land was flat, unmarked by hills but hidden by Oaks and Mesquite along the fence lines. Marked by roads. Marked by rows of corn and telephone lines and by a city out on the plain. The black and white cat sat on the pavement, looking up. Tail going back and forth. Looking up into the springtime tree. Watching the birds. The cardinals, one red, one brown, were worriedly hopping back and forth, noisily back and forth, trading spaces on the branches while the cat watched. The cat waited for one of them to fall like the God-watched sparrow. One of them could trip on a new leaf and tumble from the tree and fall head first and flapping upside down screaming down to the pavement. The cat didn't want to eat them, the bipping birds. The cat wanted them to fall. You can fly, the stray-stare said, and then you can fall. The birds worried about this, working between the branches worrying their perches, flying but only a little, only a little putting out of the wings in a little hop-fly to see that they could still land on their feet and still take up the air, still stay there above the cat. They said this to each other: are you sure? are you sure? are you sure? And of course they weren't sure because the cat was there, because the cat could wait. What else has a stray got to do? The cat could wait and flip his cat tail back and forth and the cat could look up until it got too dark to see. Then he could use his cat eyes to wait for the fall. The cat didn't make a noise. On the next station over, the radio snaps and whooshes like the wind is blowing through the broadcasting station and Brother Green is speaking on the subject of the devil and God’s coming day of wrath. Brother Green says “devil” like it’s two words: “dev-ill.” He tells me horrible things are going to happen to me and he asks God to not kill me at least until Brother Green finishes the sermon. He asks himself questions — Brother Green do you really believe that God is vengeful? — and he answers them — yes I do. Revamped book review section at the LA Times. Apocalyptic McCarthy novel wins Pulitzer. Good design is not just about being pleasing to the eye. Trends reported on 40 years of freshman. Mixing the media of poetry and film. Teenage holy war: All the way to root beer. Faking it the authentic way. American literature and the American literary establishment. Contradictions of the young journalists. 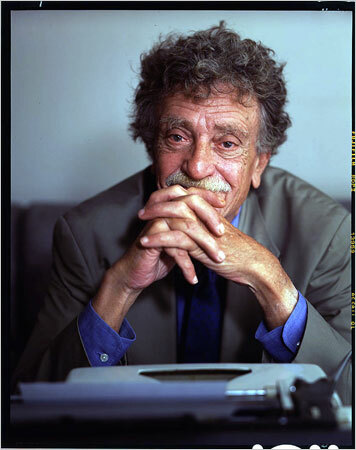 To me, hearing that Vonnegut is dead is like hearing that it will never rain again. Johnny Cash's house burned down today. He spun the wheel of the gun. Every slot in the cylinder was loaded. His thumb slid up and down, caressing the chambers and slowly turning the wheel one fluted slot at a time. Click. Click. Click. The files slumped on the desk. The office was dark. The TV flashed faces. The man on the TV said, Let us dream again. Again we have this choice to make: Hope or despair? He passed the gun from his right hand to his left hand. He didn't hold the handle of the gun. He held it by the middle, by the wheel. The office was silent with the blue of the TV. He put the gun in his coat pocket, felt the weight pulling down. He took it out again and passed if back to the first hand. The man on the TV said, Again we have to decide. The way things are or the way they could be? The question is, do you believe we can, with an act of imagination, can change everything? The gun said Smith & Wesson. He said, The wheel on the gun goes round and round, round and round, round and round. The station wagon sat by itself around the side of the building. The rest of the parking lot was Lexuses and Lincolns, sports cars and luxury sedans. The rest of the parking lot was new cars in solid colors and wax jobs. The station wagon was parked by itself in the turn-around next to the dumpster. The neighbors noticed. A woman sitting in the sun on the second floor down the row turned her head and looked that way. A mother walking her kids to the corner park and a man walking with his girlfriend to the car noticed, looked and looked away. The maintenance man trolled by in an electric powered golf cart with a set of brooms sticking out where the golf clubs usually go. He trolled by slow and took in the Chevy, the rear window rolled down and the back doors open. He looked at the fuzzy ceiling liner drooping down and held up by pushpins and the belongings all bagged and boxed in the back. The maintenance man turned the cart down the hill and looked back again. The three new tenants ignored it. The three new tenants were oblivious. They walked back and forth from the woody wagon to the swinging glass door of building number P. The walked up and down the interior stairs, holding the boxes to their bellies and the bags over their shoulders. The older woman lifted the flip-lock on the sliding glass door and stood out there. She set a wide-mouthed ash tray on the top of the wooden railing painted blue and yelled down to the other two too loud, Hey y'all, you seen how big the closet is? We could keep a kid in there. She laughed, leaned her head back and opened up her mouth full of cracked teeth and the black hole of her throat and gutterally gurgled at her own joke. The three wore broad-butted shots and tee shirts like tents. The man brought a half a 24 of Bud out of the car. The women pulled a mattress down from the roof rack, balancing the queen-sized on their heads and slipping a little in the pine straw. The man brought up a collection of cups from Taco Bell. A woman carried a Zena box with a picture of a TV and a woman carried clothes in a straining garbage sack. Nobody called it desegregation, but that was how white people came into the apartment complex. They left the window open, the first night. They left the lights on and they played Elvis and Garth, Hank Williams III and Patsy Cline. They sang along. The old woman and the man danced a couple of stiff steps together in celebration on the carpet and the other woman watched something on TV. They put a trash can on the balcony and from the couch the younger woman tossed an empty beer can underhanded into the barrel. The beer can bounced off both side and crashed down into the empties piled at the bottom.